As an alternative to a baritone, this is a great option for truly crushing metal tones. It plays nicely and looks great too. Great metal tones. Cool finish. Very comfortable to play. Only the unavoidable restrictions caused by the factory-set D to D tuning. The RGD2120Z is intended for down-tuned use, and comes tuned D to D out the box. The Silver Cobweb finish of the RGD sets out its metal intentions clearly. Ibanez can take a great deal of credit for reinvigorating the 1980s rock guitar market. In 1986, Van Halen had parted company with original singer David Lee Roth, who immediately teamed up with another hot shot, a certain Steve Vai, to produce two albums of jaw-droppingly brilliant music. The story of the development of Vai's then-new signature model, the JEM, has been told numerous times, but the knock-on effect was that other players wanted the same style of instrument. Ibanez quickly realised this and within months of the introduction of the JEM777 in 1987, had also introduced the RG550, with four colour options that included both Desert Yellow and the newer Fire Alarm Red, alongside black and white. 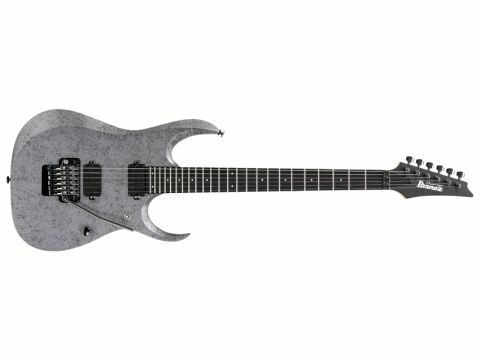 Resetting the controls of our time machine to 2011, we welcome a trio of new Ibanez electrics - including this extended scale metal machine. With an extended scale of 672mm (26.5 inches), the RGD2120Z is intended for down-tuned use and, as such, is strung D to D out of the box. It's just shy of the 'official' 27-inch baritone scale and is comfortably playable without ever feeling that you're in danger of overreaching for the low chords. A differing scale length rarely requires a change in fingerboard radius, and it remains at 430mm here. The neck feels slightly rounder than it's sibling the RG3250 and, huge though the 24 frets undoubtedly are, the guitar has again been nicely set up. This is an RGD, which includes guitars that feature the same RG body design, albeit with a serious amount of additional shaping, most significantly at the forearm and belly contours. The end result is a look that's not too far away from the Music Man JP range and the stunning Silver Cobweb finish of our example lends itself perfectly to the guitar's metal intentions. Where baritone guitars can lose clarity at high levels of gain, the combination of the hot V Custom pickups and the low action gives a tight and abrasive tone that also marries cut with adequate beefy midrange. It doesn't have the shrill high-end of an EMG89 and provides the perfect tones to satisfy one's classic metal thirst. There's no discernible change in string tension either, even though the guitar is strung with a standard 0.010-0.046 set, so Hetfield-style staccato downstrokes feel as authentic as they did on the ESP LTD SnakeByte that we reviewed recently, and using the toggle's middle position warms proceedings up for a fuller tone that's ideal for solos. Cleanly, the richness of the lower tuning gives slower passages just the right amount of brevity and adding a slow phaser gives a tone Mark Tremonti would surely enjoy. The neck pickup retains the trebly edge, and single-note Mastodon-style licks remain clear, fat and distinct here. The two Prestige guitars are certainly eye-catching and are as likely to repel as they are appeal. The RGD2120Z's extended scale and dark looks will ensure it has a place in many a metal player's heart and the contouring to the RG body shape does increase its comfort. It costs a fair bit, but remember that this is a high-end Japanese-made instrument, and as such we're comfortable with the price point.